I started the new year off by cleaning out and organizing my pantry. I am moving in 5 months (!!!) and I am already stressed about using up all the food in my kitchen hoarder’s nest. I did some healthy freezer meal planning and tried to use up anything and everything. 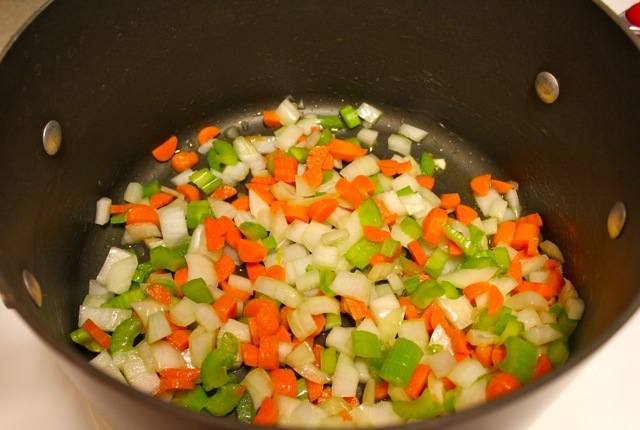 This vegetable soup is a great place to use up canned and/or frozen vegetables, broth, and meat. And it is slow cooker friendly! I will admit that I only started using my crock pot on the reg this winter. Before now I was kind of skeptical and did not think that throwing 20 things in one pot for 8 hours could turn out anything good. Now it’s 3 AM, I just got off a swing shift, and Daube Provencale is in the slow cooker. 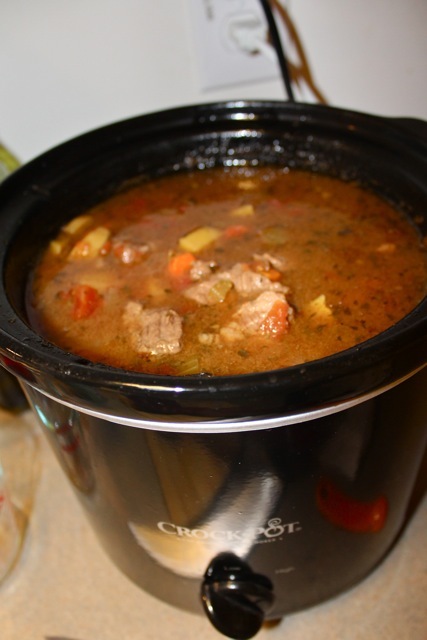 If you haven’t made a New Years resolution yet, it should be to experiment with your crock pot. And if your resolution is to eat healthy – this recipe comes in at 350 calories for each of 8 servings. My goal was to use up ingredients so I used some low-ish quality stew meat that was in my freezer for a few months to make this soup. It turned out perfectly tasty. So use meat that you have or whatever is on sale. My mom always makes homemade vegetable soup and this soup reminds me of hers. She makes the soup a little more tomato forward though. You can use really any vegetables you like that you have on hand. Do not try and use up 15 pantry items in one day or you will end up maxing out your Tupperware (see below). My other New Years cleaning project recipes were Chicken Pot Pie Soup and Stuffed Bell Peppers. I also could not tackle soup endeavors without a large pot of homemade chicken stock (see chicken soup a la David Chang for the recipe). 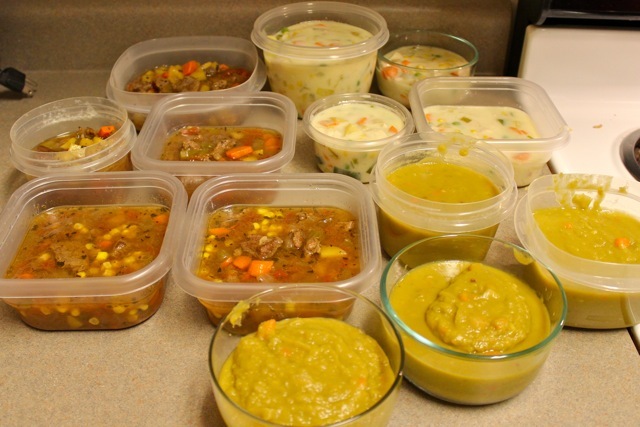 And the Split Pea Soup is just too addictive and I had to make more. In a large pan, heat oil over medium high heat. Cook the stew meat in batches, browning all sides, ~5 minutes. Remove steak with slotted spoon and transfer to the bowl of a slow cooker. 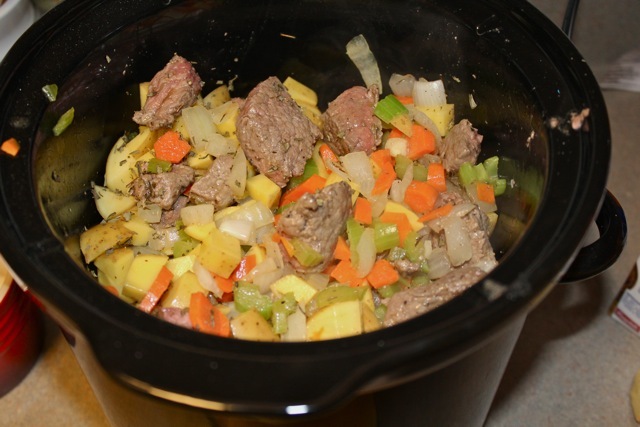 Add the remaining ingredients to the slow cooker and mix together. Cook on high for 4 hours or on low for 6-8 hours. The steak should be very tender and fall apart with a fork. Season with salt and pepper as needed. Remove bay leaves before serving. I am back into only eating homemade bread in 2015. I lasted way longer in 2014 than I thought. I actually did not purchase any bread products for 6 months! I blame weekend beach trips and those delicious onion buns from The Fresh Market. Those onion buns were a gateway into my old carb charged ways. But what does fascinate me is how hard it was to buy that first loaf of white bread from TFM. I looked at the loaves of bread for weeks before I could bring myself to buy one. And then it was a slippery slope. But this bread is proof that practice does make perfect. 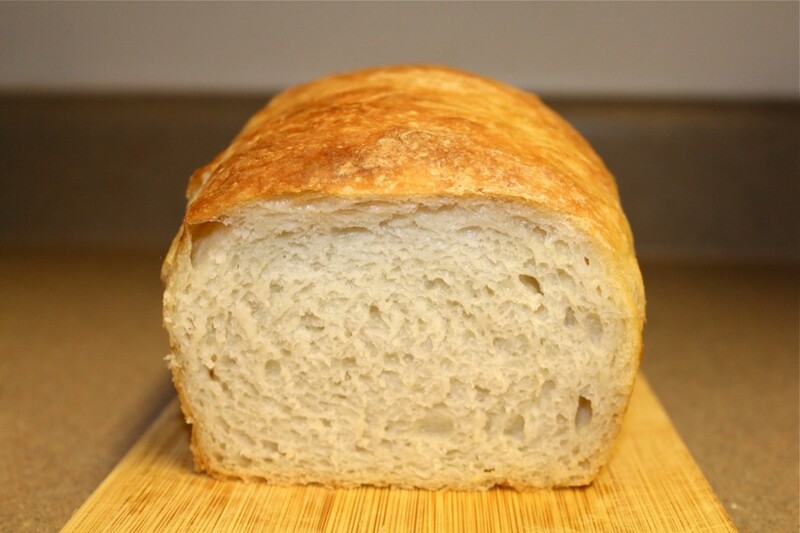 This is my best bread recipe yet and it is so easy! This recipe is along the lines of Artisan Bread in 5 Minutes a Day. But the recipe is tailored to a standard sandwich bread loaf. I love the freeform loaves and I love baguettes, but this is definitely better for making sandwiches and easier to portion control if you are counting calories. Forming your sandwich loaf really does not take more than 5 minutes. This dough is easy to work with, and all you have to do is just keep stretching and turning it until it is approximately the length of your pan. The dough can be stored in the fridge for up to two weeks. If you are counting calories in the new year. I calculated this at 100 calories per oz, a thin slice is about 1.2 oz. In a large bowl, mix together the flours, yeast, and salt. Add water and mix together with a wooden spoon. The dough will be shaggy and sticky. Cover with a towel or plastic wrap. Proof on the counter at room temperature for 5 hours. 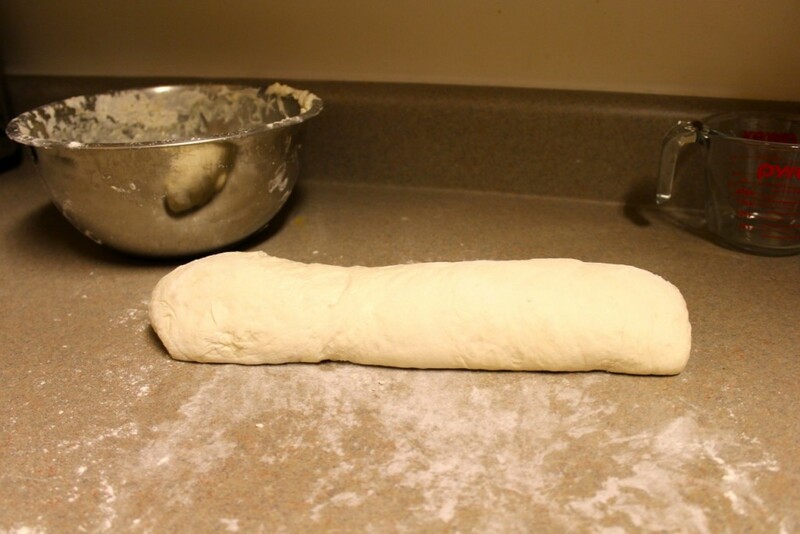 Make sure you use a bowl/container large enough to accommodate the dough doubled in size. After proofing the dough is ready to be used, or it can be stored in the fridge for two weeks. When you are ready to bake a loaf, pull off half of the dough, return the remaining portion to the fridge. On a floured surface, knead the dough a few times. 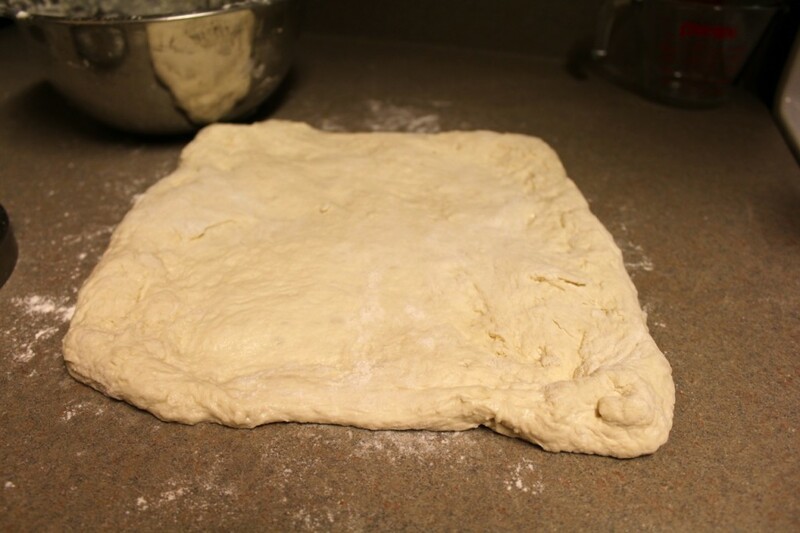 Then stretch it out to an 8×12 inch rectangle (or a rectangle that approximates the length of your bread pan). Role it up into a loaf. 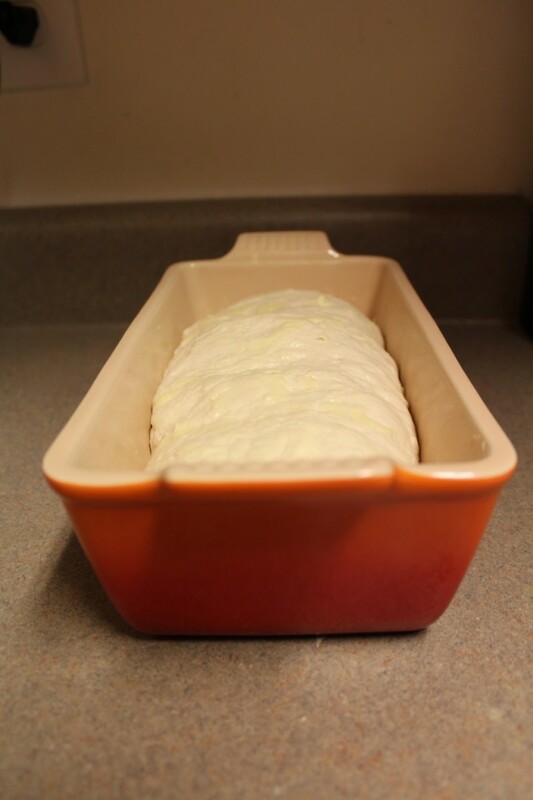 Place seam side down in a buttered loaf pan. Allow to rise for 1 hour. Preheat oven to 450 degrees. Bake for 30 minutes until it begins to brown. A thermometer inserted into the middle of the loaf should read 210 degrees when it is done. We are starting a little impromptu series here – Meals from your pantry and freezer. You should have the majority of these ingredients already in your freezer or pantry. And if you are like me, its a new year and these locations are overflowing. 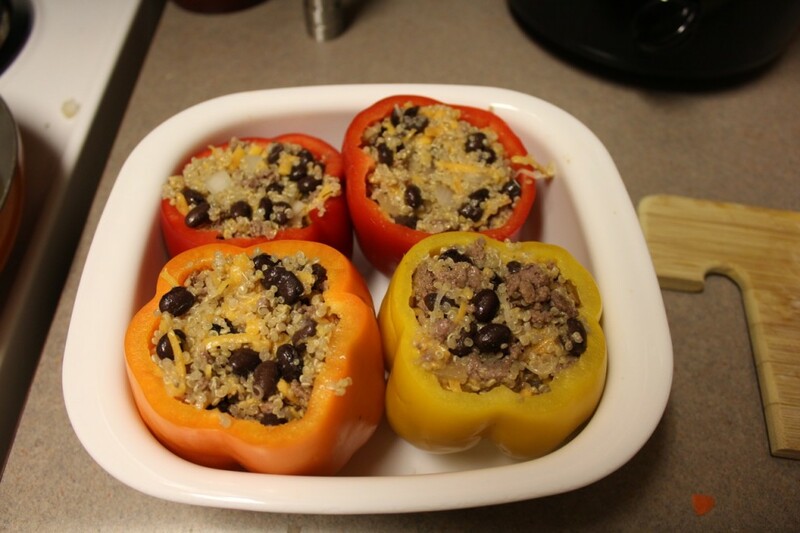 There is kind of a simple formula to this stuffed bell pepper filling: grain plus meat plus vegetables/beans plus cheese. The filling is also great for tacos or to add a little flare to your lunch salad. These are the ingredients I had stored away that needed to be used up, but you could use whatever meat you have in your freezer. Chicken, sausage, ground beef, turkey, and ground pork would all work great. As far as the grain goes quinoa, rice, farro, couscous, or anything else that inspires you will be perfect. For the veggies and beans – black beans, pinto beans, garbonzo beans are all options. Throw in some canned diced tomato or corn if you have it laying around. Any cheese you like will be great too. Cook quinoa according to package directions. Preheat oven to 350 degrees. Cut the tops off of the bell peppers and scrape out the seeds. Generously season the ground beef with salt and pepper. Brown the ground beef in a large frying pan over medium heat. Cook until there is no more pink showing. 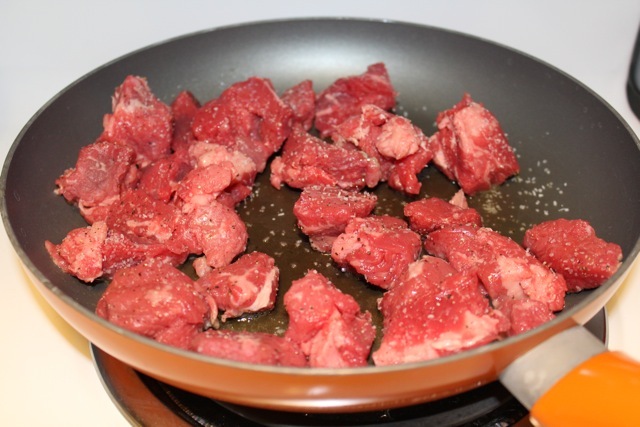 Remove beef to a large mixing bowl with a slotted spoon. In the frying pan, drizzle 1 tsp olive oil. Add in the onion and cook until translucent. Mix in the garlic and cumin and cook for 2 minutes until fragrant. Add the onion and garlic mixture to the ground beef. Mix in the quinoa, black beans, and 3/4 cup cheddar cheese. Season with salt and pepper. Stuff the prepared bell peppers with filling mixture. Bake at 350 degrees for 30 minutes. After 30 minutes, sprinkle reserved 1/2 cup cheddar cheese over peppers. Bake another 5 minutes or until cheese is melted. Serve with salsa hot sauce. It still makes me laugh when the temperature drops to below 30 degrees in Eastern NC. People just absolutely panic. Like if they go out to the car they might get hypothermia and die. I personally love it here when it gets this cold. First of all there are a lot less people swarming into the Emergency Department. And there is no traffic. I do think that if it is going to be this cold there should be snow. There is nothing like waking up, looking out the window, and seeing everything covered in a clean sheet of white. 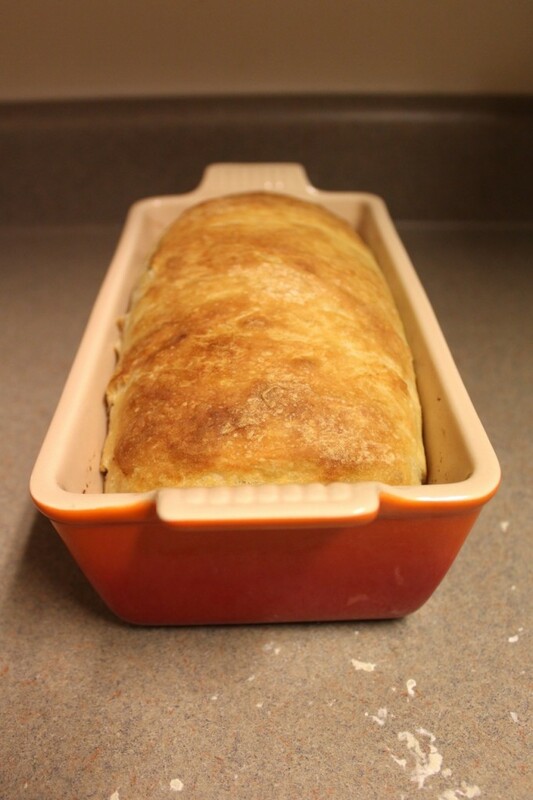 Those days are made for cooking stews, chili, and pot roast and baking fresh bread. I have to admit that I don’t really like chili that much. I feel like every time I eat chili at someone’s house or at a potluck it tastes like the hospital cafeteria chili. So I thought I would give white chicken chili a shot, and I am glad I did. This is a wonderful dish to warm up your kitchen as winter drags on. It is perfectly spicy and creamy. Serve this with a side salad and a slice of freshly baked bread. One of the reasons I needed to make this chili is that I had some exquisite half and half from a local dairy farm that is about to expire. If you live in Eastern NC, you should definitely look for the products from Simply Natural Farm. The butter and milk are incredible, you will not want to go back to grocery store brands. In a Dutch oven, heat 1 tbsp of the olive oil over medium high heat. 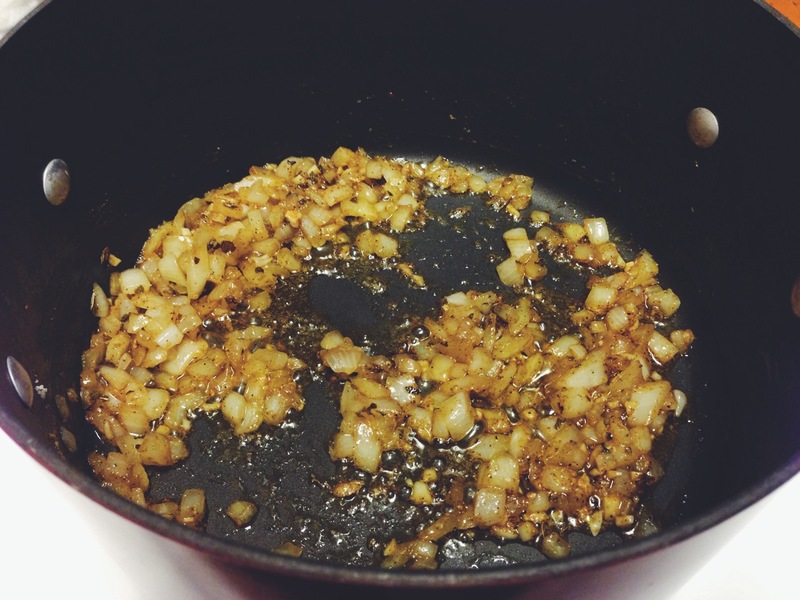 Sauté the chicken in this oil, stirring occasionally, until it is no longer pink. Remove the chicken and set aside. Add the remaining tbsp of oil to the pan, add in the onion. Cook, stirring occasionally, until it the onion starts to become translucent, about 5 minutes. Stir in the garlic, salt, cumin, oregano, black pepper and cayenne and sauté 30-60 seconds more, just until fragrant. 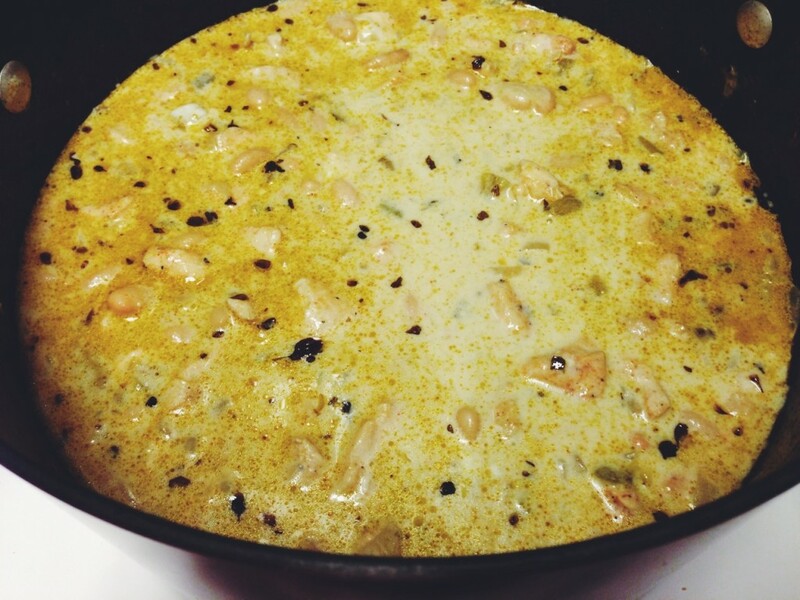 Return the chicken to the pan along with the white beans, chicken stock and green chiles. Bring this to a boil. Reduce the heat to a simmer. Cook for 30 minutes. Remove the chili from the heat and stir in the sour cream and half-and-half. Add in the sriracha. Taste and adjust salt and pepper if needed. Barely adapted from Annie’s Eats. For the new year I really wanted to make Sean Brock’s Hoppin’ John. But the peas I wanted have to be bought online and they would not have arrived in time. The black eyed peas that we cook traditionally on New Years Day are symbolic of coins. They are supposed to bring a prosperous new year. 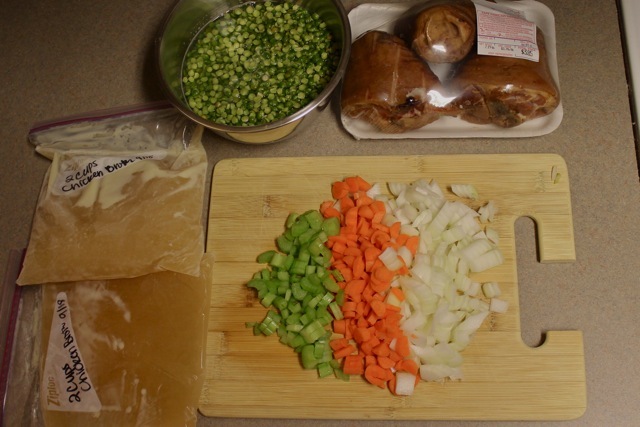 This split pea soup is my new years good luck substitute, it is after all the color of dollars. And if this soup is any indication of what the new year will be, then I guess 2015 is going to be incredible. 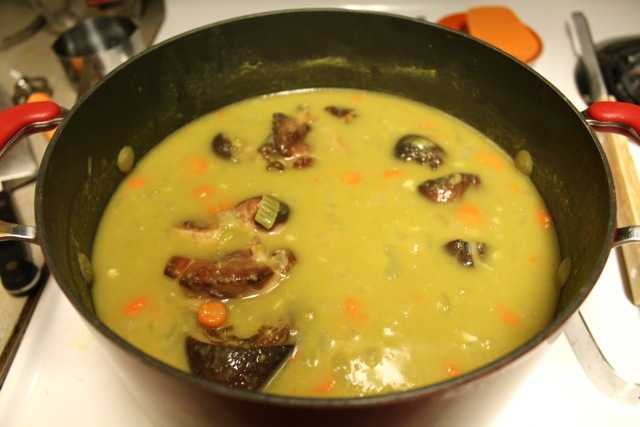 I learned something writing this blog post… it’s really difficult to photograph split pea soup so that it looks like more than a bowl of green. Usually garnishes add to the composition of food photography but this soup needs no garnishes – it is packed with flavor! The quality of the smoked ham hocks and chicken broth is extremely important. I attribute this soup’s awesomeness to the smoked ham hocks I bought from Sumrell’s Country Sausage. It is a tiny, questionable appearing butcher shop in Ayden, NC. But the meat is fabulous and of course local. This soup reminds me of my grandmother. As a kid I remember my parents would love eating her split pea soup, I thought it looked pretty awful. But as an adult, I tasted the soup, and I have been seeking that flavor ever since. The homemade chicken broth and high quality local smoked ham hocks generate an impressive depth and intense umami flavor. I have been making a lot of chicken ramen this winter and have been using my leftover broth in soups. I am serving this soup with cider from Virginia. I recently visited Albemarle Ciderworks just outside of Charlottesville and fueled my addiction to cider. The tasting room is beautiful, set in the rolling hills of VA. All of their varieties are wonderful and so different. I am currently sipping their Virginia Winesap which is packed with wholesome apple flavor and super crisp. You could serve this with chardonnay or whatever your favorite white wine is as well. Place the split peas in a bowl with enough water to cover. In a large stock pot, heat the oil over medium heat. Add the onion, carrots, celery; season with freshly ground black pepper. Cook the vegetables until they soften, 8 minutes. Add the garlic and cook for 2 minutes. Drain the split peas, add them to the vegetables in the pot. Add in the bay leaf, chicken stock, and ham hocks. Stir everything, bring this to a boil over high heat. When the soup is boiling, decrease the heat to low and cover with a lid. Simmer for 1 hour. Remove the ham hocks from the soup and set aside. Continue to cook the soup for 30 minutes more until all the vegetables have broken down and the soup is thick. 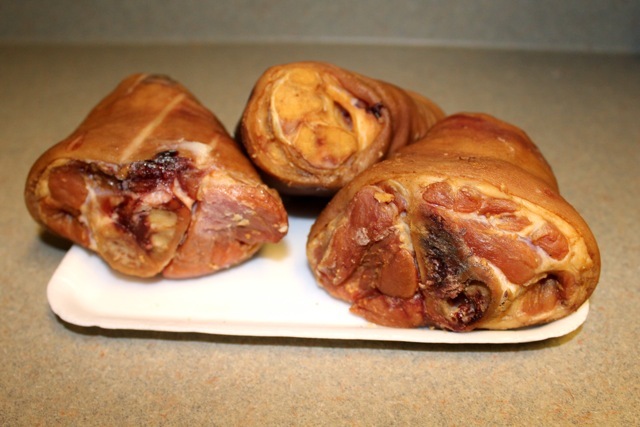 There is some meat on the ham hocks which you can pull off when they are cool and add to the soup if you like.